MISSION ACCOMPLISHED. 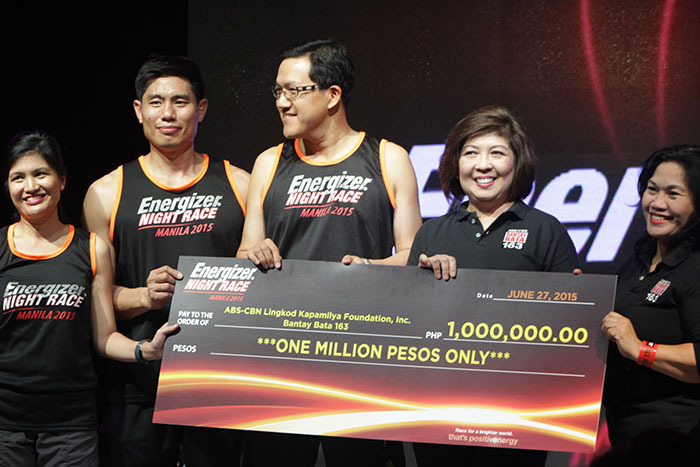 Energizer Philippines representatives hand over the mock-up check amounting to P 1,000,000.00 to Bantay Bata 163 managing director Clarissa Ocampo during the closing ceremony of Energizer Night Race 2015. Like fireflies in the night, a total of 3,000 runners participated in this year’s Energizer Night Race 2015 at the Filinvest City in Alabang last June 27, 2015. The first open loop run reached P1,000,000.00 worth of donations which benefited the children of Bantay Bata 163. 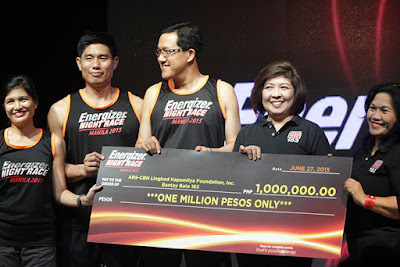 As part of its commitment to share positivenergy, Energizer encouraged the participants to keep on going and run as far and as fast as they can within the two-hour frame. Every 3-kilometer loop ran equates to P100, which was added as part of Bantay Bata163’s medical treatment funds. Meanwhile, Clarissa Ocampo (Managing Director of Bantay Bata) stressed the importance of the organization’s partnership with Energizer Philippines, Inc. “We are looking forward to engage in a joint venture with partners who have the same mission with Bantay Bata,” Ocampo said. “That’s why we partnered with Energizer—we want to light up lives. What we really need for the organization is to have partners who will be committed to help our children in ways that will affect them on a longer term” added Ocampo. The runners’ time were monitored through the radio frequency identification (RFID), which tracked every 3k loop a runner makes. For their added convenience, kilometer markers in the race route were also provided. Likewise, a battery meter lights up everytime a runner finishes a three-kilometer run. This battery meter compiled all the three kilometer runs the runner makes, until it reaches the one million target. To monitor the runners’ progress, an LED-display was positioned onstage and in the start and finish arcs. After the race, the participants gathered to listen to the hits of Yeng Constantino, Up Dharma Down, and Itchyworms.